Today is the birthday of American portraitist John Singer Sargent. To celebrate I want to talk about one of his controversial portraits Portrait of Madame X, because despite it’s blatant objectification of women, I find the portrait to be stunning. I have always loved and admired the mysterious woman for her controlled and powerful sexuality, just oozing from within the painting. Perhaps because I feel that the woman is employing the power of her beauty and figure at her own will, I am more forgiving to Sargent for the shameless exploitation of female sexuality. And I admit I may have a bit of a lady-crush on the stunning Madame X. From the beginning Sargent’s work was characterized by remarkable technical facility, particularly in his ability to draw with a brush, generating admiration as well as criticism for a supposed superficiality. But despite the international acclaim Sargent enjoyed, he was not without controversy and critical reservation. His early submission to the Paris Salon of 1884, none other than the famed Portrait of Madame X, was intended to consolidate his position as a society painter. But the entry resulted in a scandal that ruined his chance at establishing a career in Paris; though he became infamous in Britain and America. 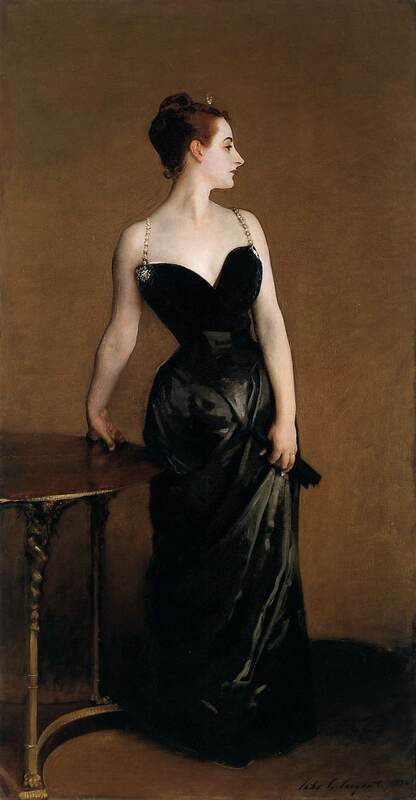 Portrait of Madame X is a study in opposition by characterized by the woman’s pale flesh tone contrasted against the deep blacks of the dress and background. With jeweled straps just gracing her pale shoulders, the sitter is practically falling out her fine black satin dress, tightly fitted to her form— it is a dress that reveals and hides at the same time. Her high forehead, graceful neck, shoulders, arms, full bosom and shapely figure assert a careless but controlled sensuality. The recessive browns add to her mystery and provide further contrast to the skin tones. The final result is a fixation on the whiteness of her skin, an overt contrivance of “aristocratic pallor”; by contrast her red ear is a jarring reminder of the color of flesh unadorned. The pose is Sargent’s careful selection: her body boldly faces forward while her head is turned in profile. A profile is both assertion and retreat; half of the face is hidden while, at the same time, the part that shows can seem more defined than full face. The table serves the dual purpose of providing support and echoing the woman’s curves and stance. At the time, her pose was considered sexually suggestive. Her unnaturally pale skin, cinched waist, severe profile and emphasis on aristocratic bone structure all imply a distant sexuality “under the professional control of the sitter,” rather than offered for the viewer’s indulgence. Though the viewer does receive a salacious and bold display of woman flesh, she is also aloof, mysterious, and clearly unattainable. Although she had refused numerous similar requests from artists, Gautreau accepted Sargent’s offer perhaps because Sargent was an expatriate also. But if their collaboration was motivated by a shared desire to attain high status in French society, its controversial reception amounted to the failure such a strategy. The attempt to preserve the Gautreau’s anonymity was unsuccessful, and the sitter’s mother requested that Sargent withdraw the painting from the exhibition. Sargent refused, saying he had painted her “exactly as she was dressed, that nothing could be said of the canvas worse than had been said in print of her appearance”. Later, Sargent overpainted the shoulder strap to raise it up and make it look more securely fastened. He also changed the title, from the original Portrait de Mme ***, to Madame X – a name more assertive and title dramatic that by accenting the impersonal, gave an illusion of the woman archetype. The poor public and critical reception was a disappointment to both artist and model; Gautreau was absolutely humiliated by the affair. Soon after Sargent left Paris to move to London permanently. Sargent brought the painting with him and hung Madame X in his studio. Starting in 1905, he displayed it in a number of international exhibitions and finally in 1916, Sargent sold the painting to the Metropolitan Museum of Art. He wrote to the museum director “I suppose it is the best thing I have ever done.” and honestly, I find I am of a like mind with Sargent. Even though he created many remarkable paintings of incredible places and people, Madam X remains my favorite for the reserved sexuality she masterfully unleashes upon the viewer.